SEOversite, an award-winning website design, search engine optimization (SEO), pay-per-click (PPC), and social media oversight company, is unique in its ability to serve a variety of business niches. While we have a robust footprint in businesses entrenched in the beautiful (plastic surgery, med spa, luxury e-commerce, real estate, brick and mortar retail), through the years and with many hundreds of projects connected and completed, our repertoire has grown. For years now, we have also served a growing number a of legal clientele (ranging from real estate transaction attorneys to personal injury to corporate law to, in this case, legal mediators). 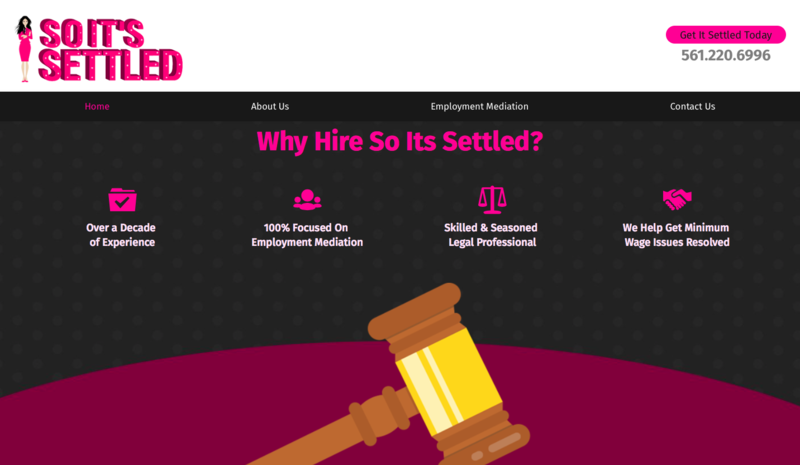 In this case study we showcase how we shook up a typically-boring sector of legal website design (LWD) to create a winning legal mediation website that stands out from the crowd. Sound good? Great - So It's Settled. 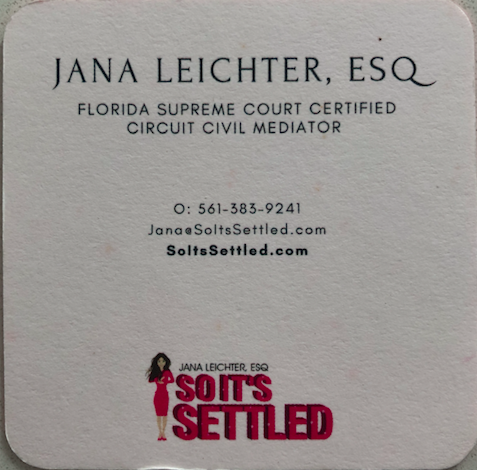 Jana Leichter, an Ivy-League educated employment attorney who had amassed 15 years worth of work experience focusing in labor and employment law after finishing her law school at the University of Miami, had made partner at her firm. After representing her clients in literally hundreds of mediations she realized she had a passion and knack for settling law suits having been able to avoid taking nearly any cases to trial her entire career - wow! It made sense to her to become a legal mediator and to truly help others in getting their employment and corporate matters settled quickly and amicably. 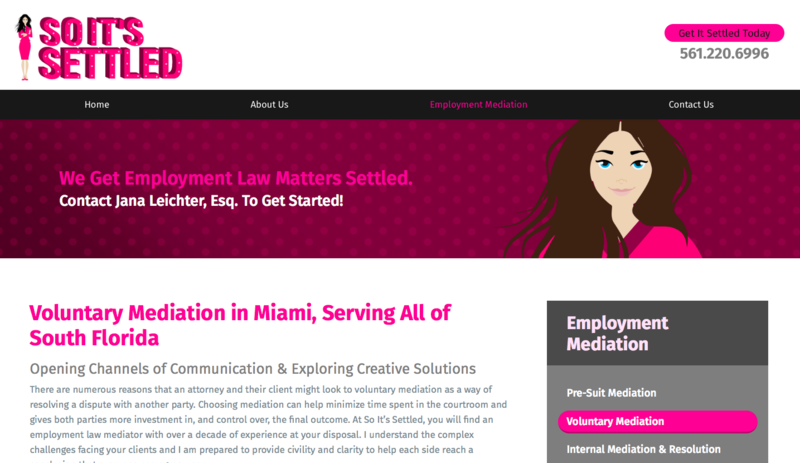 And while other excellent mediators existed, she felt her unique style could add something rarely seen in the South Florida market for mediation. Jana, was a hard-hitting partner in her firm when necessary, but believed clients won more "bees with honey" and that the key to settling cases was balance. Her brand and business were based on these principles. As a woman and a mother, on her site, she showcases those realities alongside intelligent, impressive, analytic content. 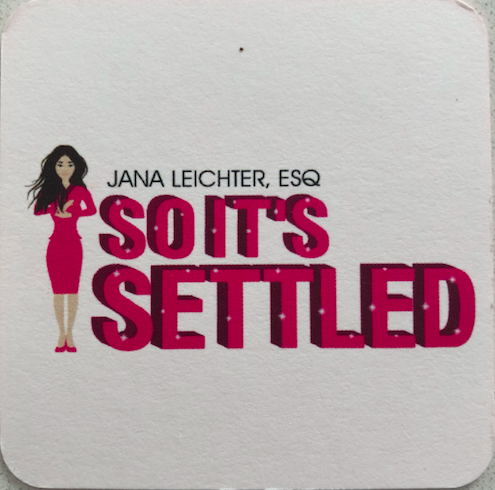 As a gregarious, positive, female mediator who believes mediation can bring people together and get them home happy with cases settled, it was important to Ms. Leichter that in overseeing the entire website design and strategy for this website that we were sure SoItsSettled.com was a reflection of those ideals. The tongue-in-cheek logo and slogan "so it's settled" is both a powerful URL for a website with strong key word SEO, but also the goal of the entire company led by a leader who takes cases seriously, but approaches them with a touch of humanity. We'd argue this is the most cutting edge legal mediator site in the country currently. Unlikely websites for attorneys, many mediators remain behind the times related to marketing and typically stick with static, short pages for existing clients and known referrals to glance through. They lack content, differentiating factors, and memorability. 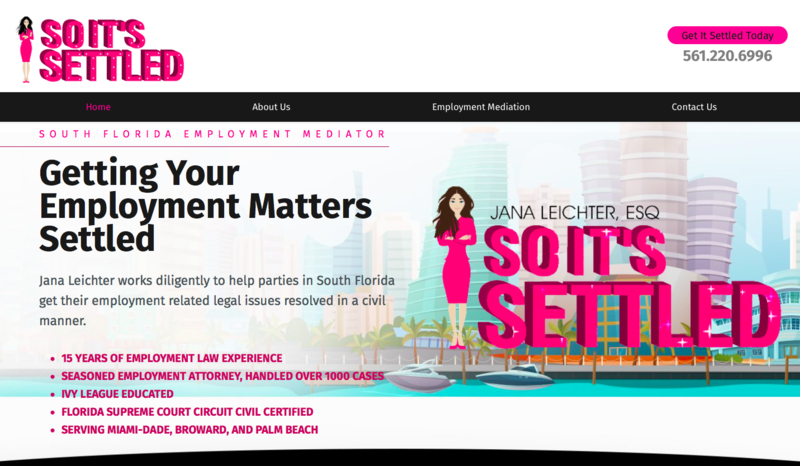 Ms. Leichter sought to both dominate the website rankings for the somewhat limited search terms for mediators in the state of Florida, but also to immediately create an impression and a brand within the small world of attorneys seeking employment, labor, and corporate mediators who visit her site. Our sleek, fun design coupled with superb in-house writing helps differentiate, the key to building business in an industry where everybody seems similar. The basics are simple. You are, or are not, an attorney. If you are, you are, or are not, seeking a mediator for your case. 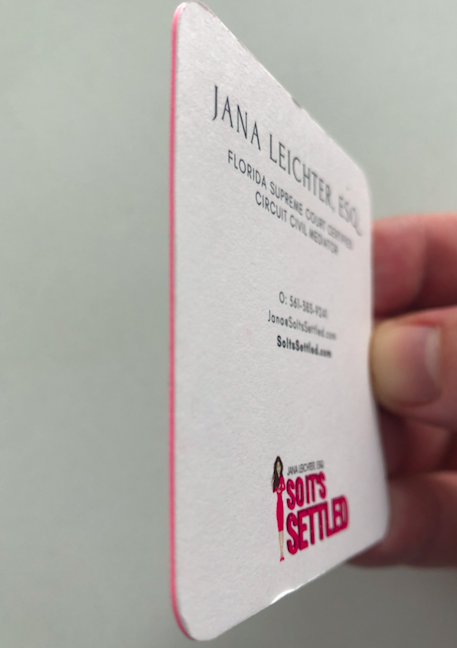 And if you find this website through searching Google, through an existing client referral, or by visiting the site listed on the company business card, there is a high likelihood you will remember SoItsSettled.com now or for in the future. Business is booming since site launch and conversion rates are impressive. We love projects like this where our creative flag can fly and seeing our happy client thriving. In addition to website design, our in-house creative team worked to develop high-end business cards that were on-theme. The next 3 images below and above showcase the beautiful, thick card stock, "pink professional" image that is animated on the website homepage, and a whimsical yet sophisticated card stock. While not the ideal branding or imagery for many businesses, it works perfectly for a fun brand that must be remembered while maintaining a professional, fun, femine feeling that is so important to this leading brand. Back View of the Matte Card Stock with Branding and Logo - Do you like it? We do. So It's Settled!